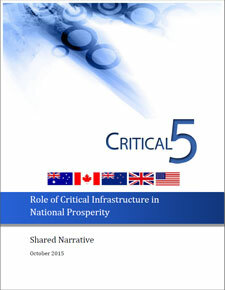 The following narrative represents the shared views of the Critical 5 member nations (Australia, Canada, New Zealand, the United Kingdom, and the United States) to provide a strategic overview of the relationship between critical infrastructure and national prosperity. In order to gain a deeper insight into this relationship, the Critical 5 members conducted and analyzed research on the correlation between investing in critical infrastructure and the resulting impact on national economies. Through research and analysis, the shared narrative will enhance and help develop a better understanding of how our five countries address this interrelationship. From this enhanced understanding we will identify similarities in approach, concept, and implementation to better inform and advance continued research and dialogue on this key issue for critical infrastructure security and resilience. This project builds on the shared narrative on ‘forging a common understanding of critical infrastructure.’ For that inquiry each member had existing frameworks and policies in place that contributed to clearly articulate and communicate a common message on the value, meaning and importance of critical infrastructure. This shared narrative used a twofold approach: starting with increasing understanding of the relationship between national infrastructure and national prosperity based on the literature available in each country; and then moving on to explore and draw out the similarities between our infrastructure owners’ and/or governments’ approaches as appropriate. Literature on this topic should not be excluded just because it has not been done by our own departments. Any literature that exists adds value to developing this common understanding and should be considered. For this narrative, research that explicitly links critical infrastructure to national prosperity was not always evident. Therefore, we look to examine the correlations through a number of different lenses noting the links between infrastructure investment and economic growth and prosperity, although there is little recent literature quantitatively evaluating this. This shared narrative begins by examining how each nation addresses the interrelationship between critical infrastructure, national prosperity, and the national economy at the strategic level. The governmental policies, doctrine and directives of members approach this in various manners but they do establish that modern, efficient infrastructure is vital to the success of modern economies and national prosperity. Well-designed infrastructure is an essential driver of national prosperity and is a pre requisite for economic expansion and for future growth to occur. Infrastructure enables a nation’s productivity, quality of life, and economic progression by driving growth, creating jobs, and improving productivity, quality of life and efficiency. It underpins growth by providing the supporting networks upon which we all rely. Networked infrastructure, such as transportation and communications, boost long-term economic output because they provide benefits to other sectors, such as improved business efficiency, effective mechanisms to coordinate and manage supply chains and product delivery. Resilient and dependable networks enable business confidence which leads to increased business investment and growth and the creation of new economic opportunities. Investment in infrastructure and how these investments are managed can also have a significant impact on government economic objectives. New investments can make a significant contribution to productivity and economic performance if they have high benefit-cost ratios. Infrastructure investments are essential for the functioning of the economy and contribute to business efficiency, connectivity and business growth which can result in improved confidence in current and future infrastructure. New Zealand has made significant investments in infrastructure since 2009 to address historic patterns of varied investment levels, including over NZ$12 billion on roads, NZ$3.2 billion on rail, NZ$2.1 billion on faster broadband, NZ$5 billion on increasing the capacity, performance and reliability of the National Grid, and $16.5 billion on the rebuilding of Christchurch following the earthquakes. The Future Investment Fund was also established in 2012 which has provided almost NZ$5 billion of new capital spending including almost NZ$1 billion in transport, over NZ$600 million in education and almost NZ$700 million in health. Australia has committed $29.5 billionFootnote7 to the roll out of a national broadband network that will enhance the efficiency of Australia’s telecommunications infrastructure. The provision of a fast reliable network will support Australia’s future economic and social growth. Increased connectivity will enable access to new markets, reduce costs and drive innovation. This initiative is estimated to yield net economic benefits of $18 billionFootnote8 to Australia. Governments do play a unique role in infrastructure due to their ability to provide strategic direction through planning and regulation. This role sets the environment to support wider infrastructure planning and investments and thus economic prosperity. Governments can also be a significant owner/provider themselves, although their investments alone may not be sufficient when considering the budgetary monies available and the magnitude of repair, upgrades and new development required to maintain economic competitiveness. Governments can consider promoting an attractive climate for private investment in infrastructure to improve the quality, quantity and competitiveness of economies, as well as removing barriers to private investment in public infrastructure, to improve the attractiveness of public infrastructure as an investment. Extensive and efficient infrastructure is critical for ensuring the effective functioning of the economy, as it is an important factor in determining the location of economic activity and the kinds of activities or sectors that can develop within a country. Well-developed infrastructure reduces the effect of distance between regions, integrating the national market and connecting it at low cost to markets in other countries and regions. Critical infrastructure is the backbone to modern society and it is essential to national prosperity. Resilient and secure infrastructure is vital for economic prosperity because it not only underpins the effective operating of businesses and services, but also underpins long term confidence and planning in a region, and thus ongoing investment levels. Providing this resilience and security can therefore act as both a direct injection into the regional or sectoral economy as well as a catalyst to further economic growth and investment. However, when there are disruptions to the services critical infrastructure provides, such as energy, transportation, and communications networks, there can potentially be costly direct economic impacts, such as the cost of repairing damage to physical structures, and indirect economic impacts to society, such as the business disruption to the global supply chain and an increase in short term and long term unemployment. These disruptions of critical infrastructure can affect the timely delivery of goods and services that are imperative to national economies, which can be measured in the loss of business and tax generated revenue in the affected areas. In addition, when critical infrastructure is disrupted there can be broader regional and national impacts. When large-scale disasters strike there are tangible and measureable direct and indirect economic impacts to a disrupted and dispersed workforce, to commerce and manufacturing sectors denied power, transportation, supply chains, and society as a whole. For example, in the United States, Hurricane Sandy caused US$65 billion in damages and economic lossFootnote9 and in New Zealand the Canterbury earthquakes of 2010 and 2011 are estimated to have caused NZ$40 billion in economic loss. In Australia the 2011 Queensland floods resulted in $A 2.4 billion in damages and a reduction in GDP of $A30 billion. Persistent or irrecoverable damage and prolonged recovery times to businesses and economies serve to extend losses. These serve to underscore the importance of enhancing critical infrastructure resilience within organizations. Modern societies are becoming increasingly dependent on the critical infrastructure systems that provide essential services that support economic prosperity. However, because these systems are increasingly interdependent the potential exists for initial large and small failures to cascade into events of catastrophic proportions. When our critical infrastructure is diminished or disrupted, we feel the economic impact from threats and consequences. Investing in resilience and mitigation and building robust and redundant systems throughout our countries can minimize the length and magnitude of these disruptions. When investing limited resources into infrastructure, we should consider how we identify critical infrastructure, not just for protection, but for resilience, mitigation, and recovery so infrastructure can absorb a potential disruption or return to a steady state after disruption. By addressing these issues, investments can have both intended and unintended impacts and can result in both positive and negative consequences. For instance, steps taken to address redundancy and resilience can not only mitigate risks of dependencies and enhance critical infrastructure protection, but they can also enhance national prosperity. Furthermore, such actions can moderate risk and lead to less detrimental impacts on economic growth from natural and manmade incidents. New Zealand, for example, has considerable exposure to and experience of seismic hazards. The Canterbury earthquakes beginning in 2010 led to over 10,000 aftershocks and a NZ$40 billion recovery programme. However, the electricity network operator in the region had invested NZ$6 million in targeted resilience improvement over 10 years which resulted in an estimated $60 million reduction in potential damages caused by the earthquakes, as well as the ability for electricity services to be reinstated rapidly which mitigated economic impacts to the region. Australian critical infrastructure is exposed to a wide range of natural disasters that often strain the ability of individual organisations to respond to and recover from. As a result the Australian Water Services Sector developed guidelines to help the sector facilitate rapid, short-term deployment of disaster/emergency support to affected water corporations following a disaster. During the 2011 Queensland floods these guidelines were employed to facilitate the provision of a wide range of support to affected water companies. This support included engineering and customer support personnel and equipment as well as post-disaster support to help affected water companies prepare complex insurance claims. As a result of this aid the affected water corporations were able to restore services significantly faster than they would be able to on their own. The core recovery capability for economic recovery is the ability to return economic and business activities to a state of health and develop new economic opportunities that result in a sustainable and economically viable community. The speed and effectiveness of returning a community to self-sufficiency and vitality depend upon quickly adapting to changed market conditions, reopening businesses and/or establishing new businesses. National governments may choose to consider establishing methodologies that can assist local governments and agencies to identify and understand the relationships among the people, businesses, industries and social organizations, networks, and cascading impacts from disruptions that sustain a community's socio-economic vitality to aid in recovery and improving resilience. Government can also signal long term confidence in an area by returning operating services to the affected area quickly, which can act as a catalyst for private sector rejuvenation. Critical infrastructure recovery and restoration requires both public and private commitment to provide limited funds and may necessitate the deployment of personnel and resources from outside the affected region. Infrastructure critical to Critical Five nations are not geo-centric and can transcend national boundaries, which requires cross-border collaboration, mutual assistance, and other cooperative agreements. The global supply chain and global economy are increasingly important considerations for businesses and government entities because of the reliance of critical infrastructure on materials originating from outside their own borders and the impact of these to national economies. The dependency on resources and raw materials outside of our nations to produce our goods and the products that drive our national economy dictates that we focus on the resilience of global supply chains. The global supply chain repeatedly demonstrates the co-existence of operational optimization with operational vulnerability. This was most recently and dramatically demonstrated in the aftermath of the tragic earthquake and tsunami which devastated the northern coastal region of Japan in 2011. All nations benefit from and depend upon a global network of infrastructure that enables each country’s economic prosperity. Collaboration amongst members is required to fully understand supply chain vulnerabilities and to implement coordinated global security and resilience measures. Digital infrastructure increasingly serves as the backbone of prosperous economies, facilitates the global flow of goods and services, and plays an integral part in accelerating economic growth. Additionally, economic security is dependent on a reliably functioning digital infrastructure. Cyber infrastructure serves many purposes, including facilitating the free flow of information, goods, and services; protecting the security and privacy of data; and maintaining the integrity of the interconnected networks. Cyber is essential to ensuring infrastructure functions efficiently and effectively, which in turn supports national economic prosperity. It is an important factor in determining the location of economic activity and the kinds of activities that can develop within a country. Well-developed infrastructure reduces the effect of distance between regions, integrates national markets and connects to markets in other countries. Strong infrastructure connections can support countries in increasingly competitive markets, particularly in exports or attracting investment. Cyber infrastructure is vital to growing and sustaining national economies. The economic reliance on digital infrastructure to prosper, however, does create challenges and creates new avenues for threats to critical infrastructure. While cyber systems may not be a critical infrastructure sector as defined by each Critical Five nation, each country uses these cyber systems and they are closely intertwined with infrastructure resources. The integrated and networked character of national and international infrastructures, such as electricity, gas and water grids, telecommunications networks, air, rail and shipping services, and the extent to which daily life depends upon their efficient functioning, has created new points of potential vulnerability. The increasing number and sophistication of cyber incidents has the potential to impact economic competitiveness and threaten the public’s ability to access and obtain basic services. Examples include the attack on Estonian networks in 2007 and the large scale denial of service attacks against Korea and the United States in 2009. Therefore, it becomes imperative to enhance the security and resilience of critical infrastructure and to maintain a cyber-environment that encourages efficiency, innovation, and economic prosperity while promoting safety and security. Governments may take specific action as a result of their understanding of the link between infrastructure and economic prosperity, in order to drive desirable outcomes. For example, by strategically placing national assets with regard to regional economic situations, which can boost or maintain economic prosperity as well as address security and supply considerations. Governments may also use their knowledge of the link between infrastructure and economic prosperity as a macroeconomic tool, such as increasing investment in infrastructure during recessions or periods of low economic growth to stimulate the economy. As noted previously, government actions can support wider infrastructure investments and thus economic prosperity. Governments may create and promote efforts to achieve national goals aimed at enhancing national critical infrastructure security and resilience by describing the actions critical infrastructure community partners can take. This can serve to guide the collaborative efforts of the critical infrastructure community to advance security and resilience outcomes. For example, the United States launched the Build America Investment Initiative in July 2014. The purpose of the initiative is for U.S. federal agencies to find new ways to increase investment in ports, roads, bridges, broadband networks, drinking water and sewer systems and other projects by facilitating partnerships between federal, state and local governments and private sector investors. Through public private partnerships and investment in infrastructure, the U.S. is committed to creating jobs, providing critical services to consumers and businesses, and protecting public health and the environment. The Canadian Government also invested approximately CAD$14.5 billion during the stimulus phase of its Economic Action Plan to modernize a broad range of infrastructure including roads, bridges, public transit, parks and water treatment facilities, and to support home ownership, help stimulate the housing sector, and improve housing across Canada. Through Canada’s Knowledge Infrastructure Program, close to CAD$2 billion was spent on the repair, maintenance and construction of university and college facilities. Within Australia’s new Critical Infrastructure Resilience Strategy launched in 2015, the link between critical infrastructure and the economy is identified as a key underpinning principle. In May 2014, the Australian Government also committed an additional AUD$11.6 billion, as part of the Economic Action Strategy, to establish an Infrastructure Growth Package that will fast-track investment in critical infrastructure across the country. This additional funding builds on the Australian Government’s existing commitment of more than AUD$50 billion out to 2019-20 to fund key infrastructure including road, rail and intermodal projects. In New Zealand, the Government recognizes the importance of resilient infrastructure as a crucial element of economic growth and has a monitored action plan under the ‘Building Infrastructure’ section of the Business Growth Agenda to ensure that the nation’s infrastructure is resilient and coordinated and contributes to economic growth and increased quality of life. New Zealand also has a National Infrastructure Unit responsible for coordinating across infrastructure sectors and formulating, and monitoring progress on, the country’s National Infrastructure Plan. Governments need to promote an attractive climate for private investment in infrastructure to improve the quality, quantity and competitiveness of economies. There is a need for governments to remove barriers to private investment in public infrastructure, and to improve the attractiveness of public infrastructure as an investment. This can be accomplished through a variety of means, such as funding mechanisms, regulation or other. Additionally, some governments may seek to encourage foreign and domestic businesses and investment in critical infrastructure. Modern, efficient infrastructure is vital to the success of modern economies and national prosperity. It acts as both a direct injection into an economy, and an indirect catalyst. As our economies look to grow and sustain growth in the future, we must address issues of aging and insufficient infrastructure, changing demands, growing cyber threats, and collaborate to fully understand vulnerabilities and to implement coordinated security and resilience measures. Analysis of dependencies and interdependencies at the national and regional levels can serve to inform planning and facilitate prioritization of resources to ensure the continuity and reliability of critical services and mitigate the cascading impacts of incidents that do occur, to support stable and confident provision of business and services and thus economic prosperity. National Economic Council and President’s Council of Economic Advisors, The White House, “An Economic Analysis of Transportation Infrastructure Investment,” (Washington, DC, July 2014), accessed June 9, 2015, https://www.whitehouse.gov/sites/default/files/docs/economic_analysis_of_transportation_investments.pdf. “Ontario Launches Consultations o Infrastructure Priorities: Moving Ontario Forward by Investing in Infrastructure to Meet Regional Needs,” Ontario Government, accessed July 8, 2015, http://news.ontario.ca/medt/en/2015/05/ontario-launches-consultations-on-infrastructure-priorities. Canada. House of Commons. Report of the Standing Committee on Transport, Infrastructure and Communities. Updating Infrastructure in Canada: An Examination of Needs and Investments. 2nd sess., 41st Parliament, June 2015. Accessed July 22, 2015. http://www.parl.gc.ca/content/hoc/Committee/412/TRAN/Reports/RP8042716/tranrp09/tranrp09-e.pdf. The White House, “FACT SHEET: Building a 21st Center Infrastructure: Increasing Public and Private Collaboration with the Build America Investment Initiative,” accessed June 9, 2015, https://www.whitehouse.gov/the-press-office/2014/07/17/fact-sheet-building-21st-century-infrastructure-increasing-public-and-pr. “The New Building Canada Plan: The largest and longest federal infrastructure plan in Canadian history,” Infrastructure Canada, accessed July 8, 2015, http://www.infrastructure.gc.ca/plan/nbcp-npcc-eng.html.